I wore this look last week (you might’ve seen it on my IG here) and got so many questions about what I was wearing!! My entire outfit is from Nordstrom and this vintage pullover is my newest obsession (available in ivory here). It’s so cozy and I love the chic, billowy feel! I also recently found these jeans and I love them so much because I literally don’t have anything like them! I was first drawn to the retro flared and frayed bottoms. They flounce and twirl with every step!! Thanks so much for stopping by! I hope you all have a lovely Thursday! This outfit is gorgeous <3 you're totally rocking a 70's vibe with the sweater and sunglasses! Those jeans are gorgeous! If I had seen them in a shop I probably wouldn’t have given them a second glance but they look so amazing on you! Love this look!!! 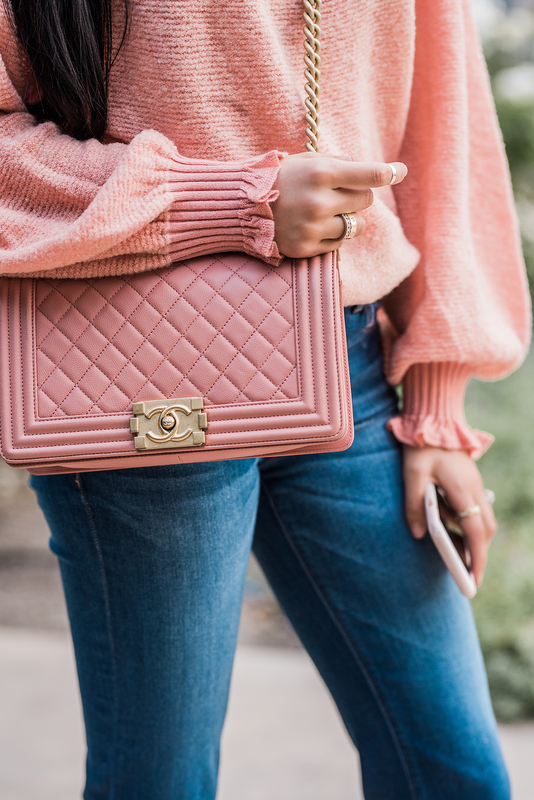 The color of that sweater and Chanel bag are to die for!! So pretty!! I love the vintage chic feel too. You are killing it in this retro outfit! I love that sweater! The oversized style and color is perfect! THAT BAG IS SO PRETTY AND FUN JEANS. Super cute, 70s chic outfit! LOVE your jeans ! Not so sure how I feel about those jeans but you’re rocking them! Love that sweater! You pull off those jeans so well! LOVE this look! Those flares jeans are absolutely fire! You styled them perfectly! Those pants are amazing! I don’t know if I am bold enough to wear those! Love the sweater! Wow I love this 70ties style! Especially your jeans and the sunnies are amazing. Love the fun denim! So cute. I love the jeans so much. And anything Free People is a go! This pullover sweater is definitely giving me vintage-chic Rach! I love everything about it; the color, the texture, the sleeves, and the neck details are amazing! Love this sweater! Oh my goodness these are sooo cute!! And they look so perfect with the pink top and bag! Loving this sweater and those cork heels! So vintage and gorgeous! I love this outfit, Rach! The frayed hem on the flares are so cute paired with those sunnies, giving off the perfect 70s vibe! Thanks for sharing and I hope you’re having a great week so far! Oh Rachel you look so casually chic in this outfit! Those jeans look fab on you! I love this look! I saw it on IG and immediately ordered these jeans. I have to hem (since I’m only 5’1″ – HA), which could be interesting! Anywho – just beautiful. Thanks for the inspiration! Omg so this sweater couldn’t be more perfect!! Great outfit! The denim pants look vintage but are far from it and the sandals are so cute! Love that sweater!! It looks so cozy and warm!! That pink top is amazing! I’m obsessed! Hello Rachel, this is an amazingly simple yet elegant outfit. Perfect for the season transitions as well.